Q1. What is the basic economic idea in the book? A1. I take an old and carefully examined idea in economics – that paying people to be unemployed creates more unemployment and paying people for being poor increases the size of the population in poverty – and show what it means for the 21st century U.S. economy in which there is a historically unprecedented number of programs helping the poor and unemployed. Q2. Are you saying that the entire recession was caused by redistributive public policy? A2. No: expanded redistribution made the recession at least twice, and probably four times, as deep as it would have been with a constant set of rules for disbursing subsidies to the poor and unemployed. Nor do I say that redistribution was the root cause of the recession – Chapters 9 and 10 of the book explain how the mortgage mess and financial crisis made it politically feasible, if not necessary, to expand the amount of redistribution. Q3. Wasn’t the recession caused by the financial crisis and the housing crash? A3. I agree that those were important causal factors. What’s new in my book is to show how those factors affect the labor market through redistributive public policy rather than depressing the labor market through some other mechanism. I also explain how the housing and financial collapses were amplified by redistribution. If the redistribution mechanism had been better understood, maybe the public policy reaction to the events of 2008 would have been less disappointing, and the mortgage assistance programs put in place by the Bush and Obama administrations wouldn’t have been so counter-productive. Q4. Wasn’t it inevitable that the labor market would recover slowly after a financial crisis? A4. Maybe, especially if redistribution were politically inevitable after a financial crisis. 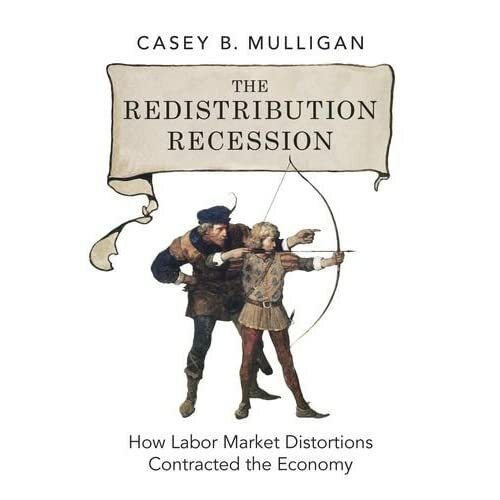 Chapter 10 of The Redistribution Recession explains how people may reasonably reassess the balance between labor market efficiency and helping people (the efficiency-equity tradeoff, as economists call it) in the direction of helping people more and thereby having a smaller labor market. Moreover, redistribution depresses the value of businesses, so the magnitude of the financial crisis may itself be a signal of the redistribution ahead. Q5. Isn’t the real problem the scarcity of jobs for unemployed people to accept? A5. It’s a fact that the job market is dramatically different than it was five years ago, but you need to keep a few things in mind. First, the cliché “there are no jobs” is quite a distortion. Over one hundred million Americans continued to be employed during the recession – that's not the same as zero. Since the beginning of the recession, Americans started a new job over 230,000,000 times – that's not the same as zero, either. Economists need to explain why hiring was 230 million rather than 270 or 280 million, not why hiring was zero. Second, the currently high number of unemployed per job opening -- a common measure of the scarcity of jobs -- could have been elevated by reduced demand, by enhanced subsidies for the poor and unemployed, or a combination of the two. Blaming our situation on a scarcity of jobs begs the question, unless that scarcity refers to something deeper than just a high ratio of unemployed to job openings. Third, the fact that, thanks to program enhancements, an increased fraction of the population finds safety net program participation to be their best available option, means that: (a) the new program participants need to tighten their belts – they cannot spend as much as they would if they were working and off the programs and (b) that the rest of Americans who finance the enlarged safety net have to spend less. To individual workers and businesses the reduced spending looks like a demand problem, but macroeconomists understand depressed aggregate spending to be a consequence of the program enhancements. To put it another way, the reduced amount of spending in the economy is no mystery once we recognize what has happened to marginal tax rates and remember how marginal tax rates affect the economy. Fourth, the book explains how some of the burden of redistribution falls on employers, which reduces their demand for labor even when employees aren't asking to be paid more. The book quantifies this effect: it was the largest during the "recovery" years 2010-11 although probably still less than the "supply-side" effects of redistribution. Q6. Hasn’t Europe proven that austerity doesn’t work? A6. I agree that European governments have typically failed to revive their economies, and probably further depressed them. But austerity is not opposite of redistribution. Think of how austerity might be implemented in the U.S.: we might cut Medicare and Social Security, but only for the more successful beneficiaries. Regardless of whether redistribution is achieved by withholding benefits from families with high incomes, providing more subsidies to families with low incomes, or both, an essential consequence is the same: a reduction in the reward to activities and efforts that raise incomes. Many kinds of austerity enhance redistribution, and that’s an important reason why austerity depresses the labor market. Q7. Are you saying that all unemployment is structural? A7. “Structural” is a useless label because it means so many things to so many people. I heavily weight one of the observations usually labeled anti-structural: that for decades we’ve had a part of the population lacking valuable labor market skills, so that skill deficiencies or disparities can only explain a slow downward employment trend and not the sudden collapse we saw in 2008-9. To a first approximation, I agree that whatever caused or amplified the recession was a sudden and historically unusual impulse. Remarkably, marginal tax rate hikes were large, sudden, and historically unusual. At a more detailed level, though, future research needs to consider the possibility that safety net expansions have a different effect against a backdrop of skill disparities than they would have in, say, the 1960s. Q8. Are you saying that the economic literature has under-estimated the effects of marginal tax rates on the labor market? A8. No, the employment effects of taxes and subsidies are something economists have examined, debated, and synthesized for decades prior to the recession. In the past, I had participated in that debate but in order to focus on the important issues of today my book does not dispute their synthesis. The Redistribution Recession simply applies the range of their results to today’s economy in which there is a historically unprecedented number of programs helping the poor and unemployed. What’s especially new in my book is a demonstration of how much marginal tax rates were hiked, not the effect that each marginal rate point has on the economy. My book does attempt to comprehensively consider the various channels by which marginal tax rates affect aggregate work hours. For example, the economic literature has long recognized that safety net benefits implicitly subsidize layoffs (Topel and Welch 1980 is a common cite), so I consider that channel too -- even though it has been neglected in recent policy discussions. Q9. Do your estimates imply that the Treasury could obtain more revenue by cutting taxes? A9. No. In terms of the wage elasticity of aggregate labor supply, the book does not put forward any new estimates but instead takes the range of 0.4 - 1.1 from the previous economic literature. If I am right that average marginal tax rates are below 75 percent, then an additional uniform proportional labor income tax would add significant revenue to the treasury. (This statement holds tax evasion and avoidance constant -- a book about tax revenue would carefully treat such topics). My book does point to particular groups with marginal tax rates in excess of 100 percent. All economists agree that the way to get more revenue from such groups is to lower their tax rates. But the book explains that, while marginal tax rates in excess of 100 percent are more prevalent than were a few years ago, they still apply to a minority of the population. Q10. Don't the dynamics of wages prove that labor demand has been the primary factor depressing employment? A10. Quite the opposite, as readers of the Redistribution Recession will see already in Chapter 2. See also here and here.